What's The Best In-Flight Beverage? Many domestic flights no longer provide free food but you can purchase various food options, from cheese plates to sandwiches. You generally can still get nonalcoholic beverages for free, though must pay for any alcohol. I am talking primarily about Economy class, not First or Business class. International flights are usually more generous, and may provide both free food and alcohol. However, few people rave about airline food and drink. When is the last time you had excellent food and/or drink on a flight? There have been numerous studies showing that food and drink actually don't taste the same when you are aboard a plane, many thousands of feet in the air. However, the science behind the reasons for this difference are not as well settled. It seems that at higher elevations, your taste buds do not operate as normal, and seem to be less effective. In addition, the air within the plane tends to dry out your nose, further decreasing your sense of taste. A recent article on CNN also noted that the sounds of an airplane can decrease your ability to taste by up to 30%. CNN was reporting on an article, Airplane noise and the taste of umami, which was published in Flavour Journal. The article noted that research has demonstrated that "loud noise can suppress the perception of certain basic tastes." This seems to indicate one of the reasons why airplane food and drink doesn't taste like it should. However, there are exceptions and the article speculates about the reasons for such, alleging that tomato juice and the Bloody Mary may be the best choices for an in-flight beverage. So why did they come to this conclusion? While four tastes, including sweet, sour, salty, and bitter, are seemingly affected by noise levels, it appears that the fifth taste, umami, may be immune. That may explain why tomato juice is so popular on airplanes, as tomatoes are full of glutamic acid and thus possess an umami taste. Because of its umami level, the flavor of the tomato juice is affected much less, if at all, by the loud noises of the plane. Cheese too can be rich in umami, so it is another popular choice on planes. Wine on the other hand has a low level of glutamic acid, and beer an even lower level, so they are more susceptible to the taste suppression caused by loud noises. However, I think there is a better beverage choice than tomato juice. Sake contains high levels of glutamic acid, giving it much more of an umami taste than wine or beer, and probably more than tomato juice too. Certain types of Sake, such as Kimoto and Yamahai, are even more umami rich than other types. As such, Sake would be essentially immune to the negative effects of loud airline noises, making it an excellent choice as an in-flight beverage. Unfortunately, most domestic flights don't carry Sake so it isn't a potential option but maybe they should seriously consider carrying it, especially as they all want to improve their food and drink selections. If they need more umami options, Sake would perfectly fit that position. And maybe they would find that more people were willing to drink Sake than tomato juice. This is the time of year when a deluge of wine articles get published proclaiming that, "It is Rosé season." Don't listen to them! It is a pervasive myth that there is a Rosé season. It perpetuates a wrongful stereotype about the nature of Rosé. And many of these wine writers actually know better. They know the truth but choose to ignore it. Stop deluding the public. What is the truth? Rosé is a year round wine, appropriate for all four seasons. Sure, a chilled Rosé can taste wonderful on a hot, summer day, but it can equally satisfy when you are at home during a snow storm. It is extremely food friendly, and there is absolutely no reason why you shouldn't enjoy it with the same roast chicken dish you serve in the summer or winter. Wine writers should promote Rosé year round rather than jump on the bandwagon and only proclaim that summer is the season for Rosé. If they recommended Rosé year round, then Rosé consumption would grow even more. Currently, France and the U.S. consume about 50% of the world's production of Rosé, with the U.S. drinking about 13%. For the last ten years, Rosé imports from Provence to the U.S. have grown at double-digit rates. As an example, in 2013, the growth rate was an astounding 40%, which certainly pleases a Rosé lover like myself. Though those figures are only for Provence Rosé, the statistics in 2013 for all imported Rosé, priced at $12 or higher, are equally as impressive, growing 39% by volume and 48% in value. Just imagine how these figures might even be higher if Rosé was promoted year round. 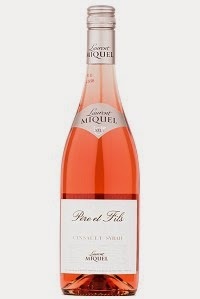 I recently found an amazing value Rosé, a $10 bottle which I cannot recommend enough. This is a Rosé you are going to want to order by the case so that you can share it with good friends and family. You'll be a vinous hero once they find how much they enjoy this Rosé. The 2013 Laurent Miquel Cinsault/Syrah is a blend of 80% Cinsault and 20% Syrah. It is a Vin de Pays d'Oc from the region of Languedoc-Roussillon, located in southern France. Laurent Miquel, an 8th generation winemaker, has crafted a delicious value Rosé, which will remind you of Provence Rosé, and he deserves kudos for this creation. The wine has an appealing, light pink color and as soon as I removed the screwcap, a delightful aroma of red fruits wafted through the air. As I sipped the wine, I was pleased with its crisp, dry taste and flavors of strawberry, raspberry and underlying mineral notes. It was easy drinking, thirst quenching, and very addictive. I actually had two bottles and had to open both of them the same day because it was just that good. As Spring proceeds, and the weather continues to improve, you are probably making plans for a summer vacation, whether it is a two week trip or simply a weekend getaway. I strongly recommend that you make wine part of your plans, such as visiting a winery or sampling different wines at dinner. There are wineries in all fifty states, and if you travel internationally, you'll find plenty of wineries too in many different countries. When you dine at restaurants during your vacation, you'll find a diverse selection of available wines, including wines you might not find at home. Sipping a glass of wine while viewing the vineyards where the grapes came from can be a superb experience. The same can be said for drinking wine with the wine maker, or sipping some while deep within a wine cellar. These are special experiences which you will long treasure, and it might cause you to purchase wines to take home with you. I encourage you to buy wine on vacation, however I must provide a caveat, a warning that you might not otherwise hear. If you find an impressive wine on your vacation, a wine that thrills your senses, which makes everything seem better, you need to understand that it might not taste the same when you get it home. It may not be as impressive or taste as good. Yes, it will be the exact same wine that you drank on vacation, but the taste may differ. Many people have eventually come to this truth, though they often don't fully understand the reason behind the transformation. It is actually simple. Your experience of a wine depends in large part on the circumstances surrounding your tasting of that wine. When you are on vacation, awed by your surroundings, thrilled by new experiences, wine may tend to taste better. You are already in a great mood, with a thrilling ambiance, so you elevate all of the elements of that experience, including the wine. Wine also tastes better with the presence of good friends, or even new acquaintances who assist in making your trip even better. You might be at dinner, sitting on a patio overlooking majestic mountains, and your wine might taste wonderful because you love the setting so much. Conversely, a bad vacation experience can make wine taste worse. So, if you buy wine while on vacation and bring it home, you will have a different set of circumstances when you eventually drink it, which will affect your perceived taste of that wine. That doesn't mean you shouldn't buy wine on vacation. You just need to understand how your surroundings affect the taste of your wine, and maybe lower your expectations of how that wine might taste at home. It will likely still taste delicious, but it may not seem as transcendent as it did on vacation. Or you can provide a better set of circumstances when you finally drink that wine at home, trying to elevate everything. For example, share the bottle with some great friends, and reminisce about your vacation experience. 1) On Wednesday, May 7, at 6:30PM, the restaurant community is stepping up once again for a worthy cause. The tasting event, to benefit the families of the fallen firefighters, Lt. Edward Walsh Jr. and Firefighter Michael R. Kennedy, will feature 25 restaurants from the Boston area. Tastings will be provided by local restaurants including Atlantic Fish Company, Basho, Brasserie Jo (The Colonnade), Capital Grille, Central Wharf Company, Cinquecentro Trattoria of The Aquitane Group, Cold Fusion Gelato, Davio’s, Douzo, Fazenda Coffee Company, Fixx Chocolates, Grill 23, Il Casale, La Morra, Mistral Group, Post 390, Row 34, Stella, Stephanie’s, Sweet Cheeks, Taranta, The Bristol Lounge (The Four Seasons), Top of the Hub and Trade as well as an open bar ($200 per person). A live auction hosted by Billy Costa of KISS 108FM & The DiningPlaybook will be held featuring a few exclusive items. 100% of the money raised will be donated to the families of the fallen heroes. Tickets are required. Please visit www.eventbrite.com via link: https://www.eventbrite.com/e/benefit-for-families-of-the-fallen-firefighters-tickets-4348889646 to purchase. For more information please email Tania@davios.com or call 617.357.4810. 2) Taberna de Haro, in Brookline, is probably the best Spanish restaurant in the area with an incredible, extensive Spanish wine list. Chef Deborah Hansen is holding an interesting wine seminar on May 6, which I highly recommend you attend. On Tuesday, May 6, from 7pm-8:30pm, Chef Hansen will present The Wines of Pares Balta. In Penedés, there is a winery owned by two brothers, Joan and Josep Cuisiné. Each married talented women who are oenologists, named Maria Elena Jimenez and Marta Casas. Together they are the force and passion behind Pares Balta, an organic winery dedicated since 1790 to making wines that express each of the 5 distinct vineyards on their land. Export Manager Oriol Bargallo will be at the seminar to discuss the personalities of 6 Pares Balta wines. I have visited this winery before and was thoroughly impressed with their operation and wines. While working at the wine store, I sometimes encounter a customer who is seeking a specific wine, yet they remember very little about it. They might only know that it had a blue label or that the name of the producer began with a "P." That leads to a "game" of Twenty Questions as I try to determine the wine's identity, asking question after question to narrow down the possible choices. Sometimes I am successful, and sometimes not. I am most successful when the wine in question is something that the customer previously purchased at the store. When the customer is trying to recall a wine that had at a restaurant, or purchased at another store, it is much tougher. There are thousands of wines out there, so trying to determine its identity from very limited information is difficult, if not impossible. However, there is something simple that consumers can do to make these type of situations much easier for all involved. And it will allow the consumer to better locate the wines they desire. During the last couple days that I have worked at the wine store, several people have availed themselves of this simple solution, and it made it easier to locate the wines they sought, or something similar. I have even talked about this simple solution before, but it is worthy of being spotlighted again. It is a solution that I use, and which a number of my wine friends also use. And it is a solution that all wine consumers should know and use. All you have to do is to take a picture of the wine bottle you enjoy. Nearly everyone carries a smart phone, with the capability to take photos, so you always have a camera handy. It only takes a few seconds to snap a photo of a wine label. You don't have to write anything down, to take any notes about the wine. The picture becomes your memory of the wine, a memory that can be easily shared with others. The picture of the wine label should be sufficient for most any wine store to identify the wine. And you won't need to play Twenty Questions with the wine store staff to identify the wine that you previously enjoyed. Though the occasional customer at the wine store has previously showed me a wine label photo, there were about five customers within the last couple days that did so. I hope this is a positive sign that more people are now taking this simple action. There is little reason why more people can't take such pictures. If you enjoy a wine, then take a few seconds to memorialize that occasion with a photo, a quick picture of the wine label. 1) The Wine ConneXtion is bringing the Kentucky Derby to North Andover. On Saturday, May 3, guests are invited to The Wine ConneXtion to celebrate the annual ”Running of the Roses” with a complimentary wine tasting of Rosés from 1pm-5pm. Rosés have finished last in the past when the wine market was flooded with White Zinfindel look-a-likes, but they are making a comeback, as savvy wine lovers have discovered that these light-bodied and delicately flavored wines are the sophisticated summer sister of their favorite red varietals. At this special Saturday tasting, The Wine ConneXtion staff will be dressed to the nines in spring attire and traditional derby hats. Guests will have the opportunity to participate in Wine ConneXtion’s own competition as they cast their vote for which will be named crowd favorite. Guests must be 21+ and walk-ins are welcome all day. Hats and traditional derby dress is encouraged. 2) On May 6, at 6:30pm, Legal Sea Foods in Park Square will host a wine dinner with Penner-Ash Wine Cellars. This winery embodies the spirit and passion of small producers focusing on Pinot Noir in the heart of Oregon’s northern Willamette Valley. Since its inception 1998, the family-owned winery has achieved impressive growth and are well-known for their deep berry notes and cherry aromas in their distinctive Pinot Noirs. Legal Sea Foods will team up with Founder and Winemaker, Lynn Penner-Ash, to host an exclusive four-plus-course dinner featuring signature cuisine paired with her selections from the Penner-Ash’s vine. 3) Give Mom a rest this Mother’s Day and treat her to a special meal at Tryst. Tryst will be serving Mother’s Day brunch from 10am-2:30pm on Sunday, May 11, featuring a special two course, prix fixe brunch menu including a complimentary mimosa or a non-alcoholic beverage. Chef Paul Turano will be serving an exclusive brunch menu throughout the day where guests will enjoy items such as Kale & Brussels Sprout Salad with toasted hazelnuts, parmesan & Verjus vinaigrette, Artichoke & Roasted Pepper Tart, Steak & Eggs, grilled steak, two eggs, crispy potatoes & hollandaise, and Brioche French Toast with cinnamon date butter & maple syrup. Each two course brunch order is accompanied by a mimosa or complimentary non-alcoholic beverage of choice. If Mom would rather sleep in, Tryst will be serving Mother’s Day dinner from 4:30pm-9pm featuring favorites such as Prosciutto Flatbread with whipped ricotta, fresh mozzarella, zucchini & herb oil ($11), Beet & Ricotta Ravioli with pistachio & crispy kale ($12/$19), and Crispy Pork Shank with stir fried vegetables, quinoa & sweet chili glaze ($21). Finish the night toasting mom with Tryst’s classic cocktails, including the Black Raspberry Caipirinha, Cachaca, Blackberry Moonshine, muddled raspberries, lime and mint ($12), and the Basil Cucumber Lemonota made with Ketel One Citroen, muddled basil, cucumber and lime ($12). The analogy seemed clear to me. Making gelato and sorbet was similar in a number of respects to wine blending, that same mix of art and science. Such an intriguing process, one that might be underestimated by many people. And a comparison I might not have made if I had not been closely involved in the creation of a new sorbet flavor. As I mentioned recently, I had the opportunity to create a sorbet flavor at Pazzo Gelato Cafe in North Andover during their special Willy Wonka Week. Jim had created a number of special gelato and sorbet flavors for that special week, and had invited a small number of locals to contribute by creating their own flavors. I was one of those lucky few and last Monday, I went into the Cafe and worked with the owner, Jim Demotses, in creating "Tipsy Sensei," a sorbet blend of Ty Ku Coconut Sake, Yuzu and Coconut. The Ty Ku is a Junmai Nigori Sake that has been infused with Coconut. When I learned that I could design a flavor, I knew that it had to involve Sake in some way. It seemed obvious that a Nigori Sake might work best, as they often can be sweeter and sometimes can possess tropical fruit flavors which would work well in this situation. And as I shopped for a Nigori, the Ty Ku Coconut stood out as a good choice for this endeavor. And I think coconut and yuzu make a good pairing, so I was excited to taste the results. As we worked on creating this flavor, I got to witness Jim's production process, including the initial calculations and preparations. Initially, Jim performs a series of calculations, determining the amounts and proportions of the various ingredients. Though there is plenty of science involved in those calculations, there is also an element of art, such as trying to determine how to balance certain flavors. For the Tipsy Sensei sorbet, should you use more coconut or yuzu? Which fruit possessed the stronger flavor? You can make gelato or sorbet with almost any type of flavors, especially any fruit, but combining different flavors is an art form, trying to create a harmonious and delicious blend. In addition, science wise, how would you handle the alcohol content of the Sake? Once the calculations were completed, then we blended the various ingredients, measuring each amount upon a scale. This doesn't have to be an exact match as you might need for baking. There is room for error here, and you can make adjustments as necessary. We taste tested the liquid mix at a few points, and at the end, the mixture seemed to be exactly what we wanted, a balanced mix of coconut and yuzu, kind of a Pina Colada flavor, but with the unique citrus taste of the yuzu. It seemed creamy and lush, and I was eager for the final product. Though it kind of resembles a light saber, this is actually a refractometer, an important tool which measures sugar density. You need specific densities for gelato and sorbet, and your liquid mixture needs to be examined to ensure it reaches these objectives. With the refractometer, you place a little bit of the liquid on a plate, and then look through the lens toward the light. You will then see a little measuring line, which notes the varying percentages. If it is not the percentage you need, you simply adjust the liquid mixture, such as by adding more fruit puree or water, until it is correct. Once the liquid is ready, it is then poured into the freezer unit, where it will sit for around 10 minutes or so. You then remove it and you have your gelato or sorbet. It might then be placed into a refrigerator for a short time, which can help stabilize and harden. We tasted the finished sorbet, and I realized more about the art of blending. The sorbet had a prominent yuzu flavor, with only a mild background of coconut. It tasted good, and I enjoyed it, but was not exactly what I had envisioned, and not exactly what it had tasted like as a liquid. I wanted a more balanced mix of coconut and yuzu, with neither flavor predominating. During the process of freezing, the flavor balance had altered. So, in making it again, the proportions of coconut and yuzu would need to be adjusted, which is an easy change. This helps to show that experimentation with flavor combinations is necessary in flavor creation, to see what works and doesn't work. The Sake worked well in the sorbet and would make an excellent ingredient for other flavors of gelato and sorbet too. Kudos to Jim for allowing me this opportunity and sparking my inspiration. 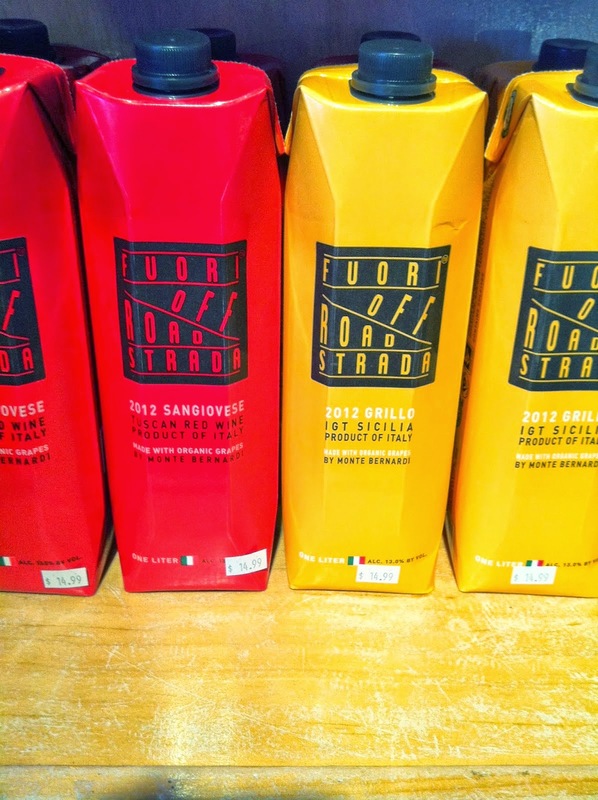 Are you a fan of the "juice boxes" of the wine world? In other words, do you purchase wine packaged in Tetra Paks? One month ago, I told my readers: "Stop ignoring the Tetra Pak." As I also mentioned, "Tetra Paks are better for the environment in a number of ways, making it a more sustainable choice than a bottle." However, that won't matter to many people unless the wine in the Tetra Pak tastes good, and I believe that the quality of wine in Tetra Paks has been improving over the years. Food Production Daily recently posted an intriguing article about Tetra Paks, noting the growth of this product. In 2013, about 1.7 billion liters of wine were packaged in Tetra Paks, a growth of 3% from the prior year, and constituting about "7% of the world's share of still wines." That seems like a substantial amount of wine, much more than I expected. And as the category is growing, it seems that more and more people are accepting of this packaging. The article also notes that the best markets for Tetra Paks currently include Spain, Argentina, Russia and Italy. The U.S. is not mentioned as one of these top markets which is probably not surprising as it doesn't appear there is much wine available here yet in Tetra Paks. However, there are at least a few very good wines available, and hopefully more will come in the near future. I agree with the gist of the article that more quality wine needs to be packaged in this way, to avoid acquiring a reputation that only "cheap" wine gets placed into a Tetra Pak. As the Beacon Hill Wine & Gourmet in Melrose sold out of nearly all of the Tetra Pak wines that were recently brought in, it is clear that local consumers are willing to take a chance on these wines. They especially make an attractive choice as summer approaches, as they are a convenient option for taking to the beach, camping, boating and more. No glass to break, no need for a corkscrew, compact size. So what is stopping you from enjoying wine in a Tetra Pak? Tickets to the party include festive tunes from a live deejay, one Mint Julep per guest, a Triple Crown of passed hors d’oeuvres (pulled pork sliders, shrimp & corn hush puppies, mini chicken & waffles) and an Oyster Bar (WiAnno, Merry Bay, Wellfleet, Naked Cowboy) from 6-7pm. Tickets and tables may be reserved online. Tickets purchased are non-refundable and have no cash value. Limited tickets and table reservations are available. Access to the event will only be granted to guests with a ticket receipt and 21+ ID. Guests may order food a la carte from the full 3rd floor menu. Roof opens to the public at 7:30pm. 2) From June 2-8, 2014, Campari® and Imbibe magazine will present Negroni Week nationwide when a portion of proceeds from every Negroni sold at participating bars and restaurants will be donated to the charity of their choice. In addition, Campari will donate $10,000 to the top fundraising establishment’s charity. Last year, more than 120 bars and restaurants across the U.S. participated in the inaugural Negroni Week, including renowned cocktail destinations such as PDT in New York; Son of a Gun and Spare Room in Los Angeles; Imperial in Portland; and many more. “What started as a grassroots movement to aid charities through a cocktail is now an orchestrated effort around the world, giving bartenders and Campari fans a chance to give back to causes that matter most in their communities,” said Umberto Luchini, Head of Marketing, Campari America. Negroni Week 2014, held in partnership the U.S. Bartender’s Guild (USBG), uses the classic Negroni cocktail - one part Campari, one part gin and one part sweet vermouth – as the catalyst to help raise funds for worthy causes. "We launched Negroni Week not only to celebrate one of the world's great cocktails but also to create a unique platform for charities nationwide," says Imbibe publisher Karen Foley. "It's such an amazing way for bartenders and cocktail enthusiasts to join forces for the greater good." Bars and restaurants interested in signing up can go to www.NegroniWeek.com. This is also where consumers can find participating bars and restaurants in their area. Negroni fans nationwide will be encouraged to spread the word on social media using the hashtag #NegroniWeek, with surprise giveaways to supporters throughout the week. Invented in Florence, Italy, in 1919, the exceptionally easy-to-create and even easier-to-enjoy Negroni is considered an aperitif – a drink traditionally consumed before a meal to stimulate the appetite. It can be served up in a cocktail glass or on the rocks, and it is always stirred, never shaken. 3) Scheduled for Sunday, April 13, the fifth annual Boston Lamb Jam brings together a slew of talented chefs and their tastiest American lamb-based dishes to compete for top honors in categories like Best in Show, People's Choice and Best Leg, Ground, Shank and Shoulder. The event starts with a VIP hour tailored to the most ardent lovers of American lamb. From 2:30-3:30pm, guests will get to snack on lamb charcuterie from acclaimed chefs Jamie Bissonnette of Toro and Coppa, Will Gilson of Puritan & Co., Louis DiBiccari of Tavern Road and Dante de Magistris of dante. VIPs will also get to sample sheep's milk cheese, wine and beer, and Elijah Craig bourbon-based cocktails courtesy of mixologist Joy Richard and the renowned bar team at Citizen. Attendees will be able to sip on lamb-friendly wines and beers from 12 of New England's best breweries (like Mayflower, Harpoon, Rising Tide and Smuttynose, just to name a few), take part in the make-your-own spice rub station and learn the ins and outs of animal butchery at a demo with Nuno Alves of Tavolo. A portion of the proceeds from the Boston Lamb Jam will support Lovin' Spoonfuls, a local organization that facilitates the recovery and distribution of healthy, perishable food that would otherwise be discarded. 4) Boston Bakes for Breast Cancer is celebrating their 15th year of sweet success in the city. This year, some of the area’s premier restaurants and bakeries will be joining forces to help raise money to benefit breast cancer research and care at the Dana-Farber Cancer Institute. Establishments will choose one dessert to feature for a week where 100% of the proceeds from sales will go directly to the Boston Bakes for Breast Cancer organization. This year, top area restaurants have kindly pledged to donate all of their selected dessert’s proceeds to join in the battle against breast cancer including: Cask ‘n Flagon’s Chocolate Torte (homemade flourless chocolate torte served warm with vanilla ice cream, topped with whipped cream and hot chocolate sauce - $6.75); Haru’s Tempura Cheesecake (coconut with mixed berry coulis, or traditional with sake claret coulis - $9); Legal Sea Foods’s Boston Cream Pie (chocolate sauce, rum caramel sauce, toffee almond crunch - $7.95); and, The Tip Tap Room’s Blackberry White Chocolate Bread Pudding (whiskey caramel glaze - $7.95). 5) Frances Mayes, the bestselling author of “Under the Tuscan Sun,” brings her line of Tuscan Sun Wines to New Hampshire for the first time on Friday, May 16 for a private dinner event at Tuscan Kitchen, a fine-dining Italian restaurant in Salem, New Hampshire. This will be followed by a wine sampling and book and bottle singing event on Saturday, May 17 at Tuscan Market, an artisan Italian marketplace and trattoria. Created in partnership with Curious Cork Imports, each Tuscan Sun Wine was hand-selected by Mayes herself to embody a different concept that touches on the Tuscan lifestyle. The private dinner with Frances will take place on Friday, May 16 with two seatings at 5:30pm and again at 8:30pm at Tuscan Kitchen. Reservations for the private dinner is limited to 50 people per seating and is $125 per person. This includes a gourmet dinner, a signed bottle of Tuscan Sun Wines, and a signed cookbook. For reservations, please visit www.TuscanSunWines.com/events. The book and bottle signing will take place the following day on Saturday, May 17 from 11:00am– 3:00pm at Tuscan Market, 63 Main Street in Salem, NH, right next to Tuscan Kitchen. Fans will be able to meet Frances Mayes, taste the wines and have Frances autograph her bottles, books, and the movie which make the perfect keepsake or gift. Frances’s wines, her cookbook, “The Tuscan Sun Cookbook,” book “Under the Tuscan Sun,” as well as the 2003 movie adaptation of her book of the same title will be available for purchase at the event. A magazine devoted to only Sake? What an excellent idea for a new, niche magazine, especially if John Gauntner, the famed Sake expert and Sake Dendoushi ("Sake Evangelist") is behind the endeavor. Now that the first issue has been released, how does the magazine measure up? The inaugural issue of Sake Today: Celebrating The World Of Sake Culture was recently published, a project founded by John Gauntner and Ry Beville. The magazine can be purchased online for about $10, which includes the cost of shipping. Retailers can purchase copies, at a discount for resale, though I am not aware of any local stores currently stocking this magazine. The original plan was to publish two issues a year, though it is possible that they may change to a quarterly release schedule. Comprised of 60 pages, the magazine has about 11 full pages dedicated to ads, all from Sake breweries. First, that is a smaller percentage of ads than many other magazines, giving you more content. Second, it is cool that all of the ads are Sake-related, and not for items like cars and watches. Even the ads stay true to the Sake focus of the magazine. There are 10 Sake articles within the magazine, with 2 by John Gauntner and 2 others without any attribution. Gauntner's articles start things off, with a Welcome To The Inaugural Issue as well as How To Choose Sake: Three Rules. Both are informative and well written articles, presenting lots of great introductory info. In the Welcome article, Gauntner discusses a bit about the history of Sake, as well as noting current consumption patterns, brewing trends and more. That Welcome article is great for Sake lovers of all knowledge levels. In the Three Rules article, Gauntner offers basic advice for buying Sake which should especially help those new to Sake. For example, seeking out the term ginjo is a very good idea. Next, there is a Filtered Wisdom article providing informative answers to 9 commonly asked Sake questions, such as how to store Sake to how does Sake pair with food. The Sake & Agriculture article talks about rice farmers, also discussing how the rice affects Sake. Though this is a bit more of an advanced topic, it is written in an easily understood manner, so will be educational for all. Did you know that nitrogen use in the rice fields will affect the levels of amino acids in Sake? You will then find Otsumami, which very briefly mentions that the Japanese prefer to drink Sake with small plates of food, called otsumami. There are plenty of photos of such dishes, but no descriptions of what each photo depicts. The article notes that the Sake Today website will have descriptions and recipes, but the site does not yet possess that information. Thus, this is the weakest article in the magazine, lacking identifying information. I will note that the photography is compelling, which applies to the entire issue. Visually, the magazine is aesthetically pleasing, which certainly reflects the Japanese love of beauty in all its forms. Tokyo: A Sake Lover's Bar Guide lists 9 bar recommendations as well as 6 Sake shops, providing a valuable guide for anyone visiting or living in Tokyo. Besides discussing Sake, there are also mentions of some of the best bar snacks at these places, from fried fish cake pillows to sauteed eggplant. This type of article would be great to see for many different locations, both inside and outside of Japan. Regionality in Japanese Sake provides a glimpse at some of the differences you will find in Sake produced in different parts of Japan. For example, Sake from eastern Japan may be light and refreshing while western Sake is bolder and more assertive. Another intriguing article that touches on issues of terroir. Craft Beer, Craft Sake notes how the craft beer movement has caught on in Japan too, with a number of Sake breweries getting involved in brewing beer too. There is a special spotlight on the Konishi Brewing Company and even some information on Nogne, a Norway brewery which makes beer and Sake. There is also an article on Sakaya, an all-Sake store in New York City which has long been one of my favorite stops when I visit NYC. The final article discusses Shuki, ceramic vessels for drinking Sake, from ochoko to guinomi. Forget Riedel glasses, and embrace some traditional Japanese pottery. Overall, I was very pleased with this first issue. It contains a nice diversity of well-written articles complemented by some great photography. The magazine is very friendly to those new to Sake, but also contains articles that will appeal to those with much more knowledge about Sake. My only issue with the magazine is that I wish it were larger. 60 pages seems very thin, especially compared to other niche magazines. However, as this was only the first issue, I suspect the size of the magazine will grow in subsequent issues, especially as more interest develops. There is a definite need for a magazine dedicated to Sake and it appears John Gauntner has compiled a good crew to bring that to life. I recommend that everyone interested or curious about Sake get a copy of Sake Today. 1) Wine in kegs is a new trend but what about Sake? SakéOne, a Sake brewery in Oregon, has recently launched a Sake in a keg, using their Momokawa Organic Junmai Ginjo. This Sake uses certified organic Calrose rice that has been polished down to 60%. The keg, holding 19.5 liters, features the Nitro Keg system, which uses 75% nitrogen and 25% carbon dioxide to maintain freshness and the Sake's flavor profile. The Momokawa Organic Junmai Ginjo Saké is now on tap at restaurants in Oregon, California, Washington, Illinois, Nevada and New York. I think this is an excellent idea, and a great way to keep Sake fresh at a bar or restaurant. Having Sake on tap should be a compelling selling point, and a great way to introduce people to Sake. Bars and restaurants can sell the Sake on its own, or integrate it into their cocktail programs. With the trend of wine in kegs, Sake can hop on that wagon and spread to a wider audience. Kudos to SakeOne for moving forward in this direction. 2) Sake brewed in Scotland? Well, the Japanese emulated Scotland and now creates some of the best whiskey in the world. Can Scotland replicate this success, but in the realm of Sake? One Scottish brewery wants to give it a try. Both the Daily Record and The Scotsman reported on the plans of the Arran Brewery, a beer brewery located on the isle of Arran. The brewery purchased land in Dreghorn where they plan to construct a Sake brewery. They have already been brewing a tiny amount of Sake but now want to take it to a commercial scale. This would probably be the second Sake brewery in Europe, the first being Nogne in Norway. Curiously, Arran plans to export most of their Sake to Japan, partially thinking that the popularity of Scotch whiskey in Japan will extend to Scottish Sake too. As Sake consumption in Japan has been decreasing over the years, maybe it isn't the best market for Scottish Sake. Sure, there would be the novelty of the Sake at first, but could it hope to compete with all of the domestically produced Sake? That seems doubtful. Arran Brewery might be better served trying to primarily sell to the European market, or even the U.S. market. They could then export a smaller portion to Japan and see how well it does there before committing a larger portion of their production. 3) With summer coming, a fresh pitcher of Sangria sounds good but what about some Sake Sangria? Over at Rocket News 24. they have a simple recipe for creating Sake Sangria and it is made from only Sake and fruit. It is more like an infused Sake as you let the fruit sit in the Sake for a day. The article even mentions how to make a Sake Smoothie with the alcohol soaked fruit. Why not give it a try? You've probably broken some Massachusetts wine laws and didn't even realize it. And even if you were aware of those laws, you probably have ignored them. It is not as if the police typically enforce those laws, though the possibility exists and recent examples of police action in Vermont may not bode well for those of us in Massachusetts. The law in Vermont states that you cannot transport into the state more than 6 gallons of wine, the equivalent of about 30 bottles of wine. In December 2013, during a traffic stop, the Vermont State Police arrested a man for violation of this transportation law. The driver had purchased the wine in New Hampshire and was taking it to New York. Though the exact amount of alcohol was not mentioned, it was noted it totaled over $44,000. Then, in March 2014, the State Police stopped another driver who was transporting 33 gallons of wine he purchased in New Hampshire. The police confiscated 27 gallons of the wine and charged him with Illegal Vinous Beverage Importation. Though such arrests are rare, having two such arrests in a short time period is worrisome. Does it indicate a new trend to enforce the law? This could happen in Massachusetts too. Under MA General Laws Chapter 138, Section 2, it states: "No person shall manufacture, with intent to sell, sell or expose or keep for sale, store, transport, import or export alcoholic beverages or alcohol, except as authorized by this chapter;..." So, if you travel to a New Hampshire liquor store, buy a single bottle of wine and bring it back to Massachusetts, you have broken the law. One bottle, one case, or two cases, it is all the same. And according to Rick Gerrish, the director of marketing for the New Hampshire Liquor Commission, more than 50% of their sales are to out of state buyers, including about 28% from Massachusetts. That is a lot of law breakers. To legally transport wine from New Hampshire, you need to apply for a special permit: Application for a Special Permit to Import Household Effects/Gifts Into Massachusetts. You will also have to pay a small fee for your alcohol, such as 55 cents per gallon of still wine and 70 cents per gallon of sparkling wine. Spirits cost the most, at $4.05 per gallon. How many people though avail themselves of this special permit? In 2009, only 168 special permits were issued and in 2013, the number had barely changed, to 169. These permits cover not just wine transported from New Hampshire, but also wine from any other state. Bringing wine home with you from a vacation? That is probably illegal too unless you possess one of these special permits. Have any of my readers ever obtained one of these permits? Even transporting wine within Massachusetts can cause problems with the law. According to MA General Laws Chapter 138, Section 22, "Any person may, but only for his own use and that of his family and guests, transport alcoholic beverages or alcohol, without any license or permit, but not exceeding in amount, at any one time, twenty gallons of malt beverages, three gallons of any other alcoholic beverage, or one gallon of alcohol, or their measured equivalent;..." This means that if you transport more than 15 bottles of wine in your car, you would be in violation. So if you buy two cases of wine at your local store, you legally are not allowed to transport it to your home without a special permit. Isn't that crazy? These laws are rarely enforced so why even have them? Why have these Swords of Damocles hanging over the heads of wine lovers? They are relics of Prohibition and the time to change these laws is now. Unfortunately, it is doubtful anything will be done by our legislators in this regard. House Bill 294 is still languishing, awaiting a vote, and the length of time it has taken to even get to that point has been far too long. However, the more consumers speak up, the better. They need to contact their legislators, to demand action. Let us work together to change these relic laws and enable wine lovers to get whatever wine they desire. 1) From May 13 to June 11, The MET Restaurant Group will host its Ninth Annual Soft Shell Crab Festival serving the delicious crustacean 30 ways in 30 days. Hailing from Maryland’s Chesapeake Bay, soft shell crabs have tantalized the taste buds of seafood lovers across the globe. The MET has explored a variety of flavors and techniques that reveal the best of this culinary creature and will offer a special soft shell crab dish each night from mid-May to mid-June. Guests will enjoy some very crustacean creations including Soft Shell Monte Cristo, Corn meal Crusted Crab with corn silk, favas and pea tendrils, Tempura Fried Crab with soy peanut sauce and cucumber noodles, and Chili Crab Pizza topped with fried crab, sweet chili and arugula. For the purist, soft shell crabs will also be available meuniére style daily. 2) AKA Bistro, one of my favorite suburban restaurants, has unfortunately been closed since December because of a flood. They now hope to open by the end of April, and that opening will bring some changes. They will change their menu concept, having both Japanese and French dishes on the same, one-page menu. The Japanese fare will include more than just sashimi dishes. There will also be a new look to their bar, a quieter & cooler dining room, and a streamlined open kitchen. I eagerly look forward to their reopening. 3) Friends of Boston’s Homeless, in celebration of decades of success in providing solutions to homelessness in Boston, announces the 27th annual Beyond Shelter benefit gala. Hosted by John Rosenthal, founder of Friends of Boston’s Homeless, alongside emcees Jonathan Soroff of The Improper Bostonian and Rita Cary of 92.5 The River, the event will feature gourmet tastings by the Boston area’s top chefs with live music by Los 4 and the Berklee Bob Marley Ensemble. Over 25 restaurants will participate this year, including Ashmont Grill, Eastern Standard, Flour Bakery + Café, The Fireplace, Hamersley’s Bistro, Gather, Fenmore Grill, Legal Sea Foods, Steel & Rye, Sweet Basil, Tavolo, Tresca, and Union Bar & Grille. Woodstock Inn Brewery and J. Lohr will serve as the evening’s beer and wine sponsors. The annual gala will also feature a raffle and live auction with items including Red Sox and New England Patriots autographed sports memorabilia, VIP concert tickets, fine art, jewelry, and luxury city weekend getaway packages. Event proceeds will directly benefit Friends of Boston’s Homeless programs to end homelessness by helping individuals gain independence through Housing First, adult education, employment, life skills development, and access to permanent affordable housing. Focusing this year on Friends’ Housing First Start-Up Fund, this fund provides long-term homeless individuals with permanent supportive housing, so they are no longer living on the streets or in shelters. Not just a humane solution to street homelessness, “Housing First” saves our Commonwealth significantly in emergency, medical, and public safety costs, roughly $10,000/person, in fact. In just three years, this initiative has helped to place over 350 chronically homeless individuals in dignified, permanent housing, over 90% of whom have maintained their housing and have not returned to the streets or shelters. 4) A group of Boston's top chefs are teaming up to help raise money for the families of Lt. Edward Walsh and Firefighter Michael Kennedy. The event, called United for Boston's Own, is scheduled for Monday, April 14. Chefs donating time, energy and resources include Ken Oringer, Ming Tsai, Jay Hajj, Michael Schlow, Mike Smith, Ting Yen, Jamie Bissonnette, Michael Scelfo and Monica Glass. "At times like this, I'm honored, along with others in the restaurant community, to rally together and support these families," says Ken Oringer, owner of Clio, Toro, Coppa and Uni. "It hopefully will help ease some of the journey that stills lays ahead of them." "Food is a great way to bring people together," says Ming Tsai, owner of Blue Ginger and Blue Dragon. "The fact that we are able to use this event to bring attention and support to this important initiative is very rewarding." United for Boston's Own will consist of a nine-course seated dinner, each one specifically prepared by one of the Chefs. It will be held at Mike's City Diner at 1714 Washington Street, Boston. Only 60 seats are available and will be sold at $500 each. One hundred percent (100%) of the proceeds are going to the Walsh-Kennedy Memorial Fund. "In the hands of an able cook, fish can become an inexhaustible source of perpetual delight." Are there reasons why you don't cook more seafood at home? Do you have difficulty, or feel intimidated, preparing seafood at home? Do you know how to best cook fish and shellfish? As I have previously said, on repeated occasions, Americans don't eat enough seafood. You should eat seafood at least twice a week, garnering its significant health benefits. A significant reason why people don't eat enough seafood is that many are not comfortable cooking seafood at home. They feel intimidated, and don't want to potentially ruin an expensive piece of fish. I have found that even some of my more food-oriented friends still are not confident cooking seafood. So how do we change that? How do we give people more confidence in preparing seafood at home? In my coverage of the Seafood Expo North America, I wrote a post, How To Cook Seafood, which included advice from chefs for home cooks on preparing seafood. I was inspired to continue in this vein, to provide home cooks with more seafood cooking advice. Thus, I have created a new series on my blog, How To Cook Seafood, which will consist of advice and recipes from local chefs. The advice will be geared for home cooks, simple suggestions and recipes that most anyone can do at home. My hope is that it will spur on more people to cook seafood at home. If any local chef is interested in participating in this series, please contact me. Now onto the first three chefs in this first volume of this series, all with some grilling advice which is a great preview as the weather starts to get warmer. "When cooking at home, especially fish, I try to keep things as simple as possible. Summer time is a no brainer, the great outdoors means firing up the big grill. I prefer charcoal, but gas is always cleaner and some what easier. "I recommend using a hearty or thickly cut steak, fish such as swordfish, salmon, striped bass or tuna. Always remember to clean the grates of the grill and swab with an oil dipped towel (this will prevent sticking). Fish like salmon or bass, I like to cook and start skin side down (lightly oil the skin side first) and then finish on the flesh side. Other fishm like halibut, tuna and swordfish, can be cooked at equal times on either sides. "Accompaniments for grilled items could be beautiful grilled vegetables, any type of salsa, or as simple as a piece of lemon. The quality of the fish should always be the star of the show. "Cooking indoors I find can be a bit more challenging for the home cook. Two great techniques are either broiling or poaching stove top. Ideal fish for broiling are sole, haddock, pollock or cod. Place fish on a cookie sheet tray and season with dry white wine, sale & pepper, lemon, pat of butter, or just EVOO. When the fish is almost done, top with seasoned bread crumbs if desired. "A good way to poach stove top is simply with a shallow sauté pan of water seasoned with salt, a touch of lemon juice and/or dry white wine. Fish such as tuna or salmon can be poached over medium heat for 2 to 3 minutes on each side. Good side dishes are sautéed spinach or peas." "When I order fish, I call my fish order in every morning to find out what just came in and what looks good. This helps us get the best possible and freshest fish. You can do the same thing when you are at the market. Ask the fishmonger what’s fresh and what just came in. Do a visual inspection of the fish. Looking for nice bright color, nothing that is opaque, shiny (shiny can mean slimy) and avoid frozen or color added fish. Ask if it farm raised (although it’s not bad, wild caught is always better). Ask if you can feel the fish. Avoid mushy fish, fish that doesn't bounce back if pressed, and nothing that feels slimy. "Depending on what you’re cooking, say swordfish, we have a grilled swordfish on our menu, topped with a lemon caper butter. Depending on what you’re doing to it you want different sizes. 8 oz, or ½ pound is a good number to base on per person. Since we are grilling we don’t want it to be too thick or too thin. To thick and it will take too long and burn, to thin it will easily over cook and become dry. So about 1 inch thick is perfect. "Ok, now for preparing and grilling. Just a simple marinade is fine. Oil, salt, pepper, chopped parsley and thyme. Don’t soak the fish. This can lead to flare ups later on. Using a gas grill can cause a butane kind of flavor and charcoal a burnt flavor, which we want to avoid. Now make sure the grill is hot to avoid the fish sticking. Shake off excess oil and place on rack. If you do get flames, a spray bottle with water can help eliminate this. To impress your friends, turn 90 degrees to make diamond marks. Swordfish you want to cook all the way through. It takes about ten minutes on each side until it is done. There are a couple ways to check if it’s done. One, temp it, 140 degrees and its done, pull it off a little before this, it will keep cooking when it’s pulled off. This way you avoid over cooking it. Two, you can check by touching it. If it feels squishy needs more time. And three just cheat and check the middle with your tongs. Looking for all white not grey." "Being a chef means spending the majority of my time in a kitchen. I don’t do a lot of cooking at home, but when I do I try to keep it as simple as possible. I don’t want to spend my valuable time off cleaning another kitchen. During the warmer months, I really enjoy using my grill, cooking outside doesn't feel like work. An ice cold beer in hand, some good music and conversation, and I’m in my happy place. I love grilling fish and then topping it with a homemade salsa, quick and easy. One of my favorite preparations is topping striped bass with a twist on salsa verde, the classic Italian sauce. During the summer months when the stripers are running, there is nothing better than fresh caught Cape Cod striper. The following recipe is super easy and can be made using a multitude of other seafood varieties. You can make this ahead of time and refrigerate, it will keep for a few days in the refrigerator. "I like to use a charcoal grill, the wood imparts a nice flavor into the fish or meat. If you don’t have a charcoal grill, a gas grill will work suitably as well. "Before grilling the fish, I brush it with vegetable oil. I don’t use extra virgin for this as extra virgin olive oil has a lower flashpoint and will flare up on the grill causing the fish to taste like gasoline. After brushing I season liberally with Kosher Salt and ground black pepper. "I like to sear the fish on high heat and then finish it with low, indirect heat. I place the majority of the coals on one side of the grill and after they are ready will start my fish, flesh side first over these. After I get a nice sear I move it to the side with very little coals to finish, this way you are ensured a nice moist center without a burnt exterior. I suggest investing in a fish spatula; you can find these inexpensively online at sites like Amazon, or in stores such as Williams and Sonoma. These spatulas have a thinner more flexible metal than traditional bbq spatulas and make it easier to turn the fish on the grill. The light oil the fish was brushed with will help to keep it from sticking to the grill as well. "Be careful not to overcook the fish. You want to pull it off the grill when the center is slightly warmer than human body temperature. Chefs test this by taking a thin metal skewer and placing it into the center of the fish and then holding it to our lips. The lip is better to test with because it is more sensitive to heat. When it is slightly warmer than your lips, remove the fish from the grill and let it rest. The fish is still cooking during this resting period and the flesh is reabsorbing all the moisture that the heat of the grill has removed. "After 5-7 minutes of rest, top with the salsa verde and serve." On Facebook, Dave Andelman, of The Phantom Gourmet, is outspoken and controversial. He has also been generally unwilling to debate his points of view there, banning numerous individuals who have voiced an opinion different than his own. I am one of those persons that he banned on Facebook, because I dared argue with him. Though I left it alone for a time, I eventually decided to pursue it, to confront him once again. Through a series of email exchanges, which began rather heated, we actually came to a consensus of sorts. In a positive step at the end, Dave agreed to participate in a public debate with me, concentrating on the issue of food trucks. Dave's opposition to food trucks is well known, and he feels very confident that he can back up his assertions. I am equally as confident that I can defeat Dave on this issue. Though all of the details have not yet been settled, some matters have already been set. In deference to Dave, the location of the debate will be the Kowloon Restaurant. There will be a limited amount of tickets available to the public for this debate, though the price has not yet been set. The ticket price though will include a Chinese buffet, with all-you-can-eat chicken wings, and a portion of the proceeds will go to fighting sexism in the restaurant industry, a charity dear to Dave's heart. The debate will be decided by three judges and Dave and I each get to select one judge, and then must agree on the choice of the third judge. I have not yet chosen my judge, though I have a few people on my list I will be asking soon, including a couple local food writers. As for our agreed judge, we are hoping to get the former Mayor Thomas Menino to participate. Dave has already chosen Ernie Boch, Jr. to be his judge. The event will likely take place sometime near the end of May, and I will update my readers as soon as the details are confirmed. Of course any debate requires some stakes, and we have agreed upon conditions to occur should either of us lose the debate. If I lose, I have agreed to make a substantial donation to Andelman's Restaurant & Business Alliance. If Dave loses, then the Phantom Gourmet must sponsor a special Food Truck event for all of their phans. I look forward to this great, purple debate!